A new Pan-European customer newsletter. Stories on front/back covers were ‘corporate’ and generic to all FedEx European countries. 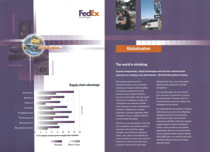 The inside pages were tailored to each individual country (in this case FedEx UK).